Like many other appliances, scrapping a microwave can be tough. However, with the right know-how and just a little bit of luck, your microwave could be worth a lot more disassembled when you take it to the scrap yard. This is because microwaves can contain sources of valuable metals like copper, and because even the more common metals used to make microwaves will be worth more if taken off or out of the machine before taking them in to scrap. You’ll also want to make sure you’re working in a clean environment—both to keep your valuable scrap clean and to keep yourself safe. Also, the first thing you want to do when beginning to disassemble any appliance is cutting the cord. This is a safety measure—and on top of that, you can get a standard insulated wire price for the cord, or strip it down to further clean and separate the conductive metal inside. Last but not least, it’s worth looking up videos or instructions for disassembling your particular brand and model of microwave online. While disassembling a microwave won’t be described in a standard instruction manual, it’s a pretty common scrapping practice, and a more experienced scrapper might have some great safety or technical advice. In the recycling business, one of the most common questions we get is whether or not a particular material can be recycled. The answers can be complicated—for example, some facilities recycle certain products that other facilities don’t, and some recyclable materials are valuable while others are not—but we always like to help people get to the bottom of it when it comes to recycling. Neoprene is one of those materials that we get asked about periodically. It is a synthetic rubber material commonly used in wetsuits, work gloves, and electrical insulation, so it’s easy enough to find—but can it be used and reused like metals and other recyclable materials? Neoprene is actually a family of similar materials, though they may vary slightly in the ways they are manufactured and used. All of them are synthetic and rubber-like. Neoprene is used because of its water and heat resistance, and because it is both malleable and strong. In addition to wetsuits and protective gear, it’s also used in laptop, tablet, and phone cases, because it can be molded to fit these devices snugly and is strong enough to protect them from damage. Neoprene also has many applications in the medical field, such as in gloves for doctors, nurses, and surgeons. Because it is used so often and for such a wide variety of products, recycling it can be great for the environment. Christmas brings families together and provides fun for young and old alike. However, the extra work at home, the extra money spent on all those gifts, and the mess left by wrapping and decorations can cause some real strain as you go into the New Year. Luckily, recycling can prove a great solution to all of these problems if you think creatively. By recycling everything the holidays leave behind, you can keep the environment thriving for many Christmases to come—and if you find the right things, you can even put some extra cash in your pocket. Know anyone who has a metal tree stand? These are often made of iron, and can be worth some money because of their weight. There are also plenty of other great opportunities for recycling just after Christmas. For example, all those lights and extension cords that have finally given out can be sold as insulated wire. While this may not net you a fortune, it can at the least make buying replacements for next year a bit easier! In addition to netting you a little cash, recycling electrical wire can have a huge benefit for the environment because so much of it simply goes to the landfill—and because mining new metal for wire isn’t cheap or great for the Earth. Some tree ornaments, too, are made of valuable metals like brass and aluminum. If you find that you simply have too many ornaments, you could see if any of them are worth anything. Older ornaments are more likely to have scrap metal value, but all of them are at the least worth looking into. Starting up a recycling program at your business’s next construction site or demolition job can give huge benefits to the environment and our community by keeping recyclable waste out of local landfills. It can also be beneficial to your business! There are a lot of negative myths about on-site recycling going around in the construction world. Most of these are left over from days gone by, when recycling was much more expensive and less common. However, now it’s easy to integrate recycling into your construction or demolition plans. Here are a few of the most common myths, and the positive truths that prove them wrong. Old lawncare equipment can be a lucrative source for recyclable scrap metal, but dismantling old lawnmowers, edgers, and other outdoor tools can be a real chore. However, with the right tools and know-how, the whole process gets a lot easier, and can even be a lot of fun. Even if you aren’t a regular scrapper yet, getting rid of old lawncare and landscaping equipment can be tough, and the money earned from selling your old lawnmowers, weedeaters, and even tractors to a Dallas scrap metal recycler can help offset the costs of an expensive upgrade or replacement. However, you will earn far more money for your equipment if you can dismantle it yourself. This holds true for virtually all other kinds of scrap as well. Because dismantling machinery allows for more precise weighing of recyclable materials and saves the recycling facility money, you can be paid more. What is Tin and How Do You Recycle It? Tin is a material we see frequently here at Encore Recyclers in Garland, but it’s also something that confuses a lot of people in the scrap industry. Luckily, we have all the answers regarding tin right here on our blog. The name “tin” is misleading. Almost any “tin” material you’ll find at Encore or any other Garland scrap metal recycler isn’t the element tin, but actually very thin strips of steel. But What About Tin Cans? Yes, tin was historically used in tin cans, which were ubiquitous in much of the 19th and 20th centuries. However, even these cans were not actually made of tin. Most often, they were made of steel, which was then covered (or plated) with tin. The reason for this is simple: tin does not corrode, but steel (especially cheaper, lower grade steel) does. It was cheaper for the canning industry to make cheap steel cans, then coat them with tin to make them weather-resistant. This advancement of engineering was important to both the military (which used tin cans to feed soldiers on the move) and to the rise of major industry and mass production more generally. Today, most “tin cans” of soup, beverages, and other canned goods are primarily made of aluminum. 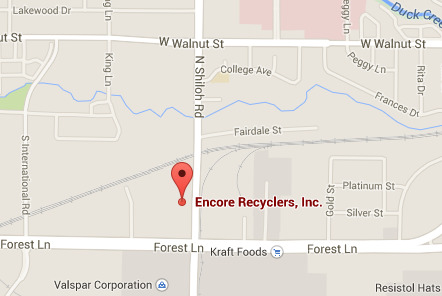 Like other recyclable metals, we’re happy to take titanium materials here in Garland at Encore Recyclers. However, there’s a lot people don’t know about this metal. Here’s some important (and even fun) information for all you scrappers out there. As you can see from the wide variety of uses it’s put to, titanium is quite versatile. This can also make it a valuable metal, especially if it’s clean and otherwise in good condition. It can be easy for scrappers to find, too! As the Dallas Sanitation Services department tells us, there are some things that simply can’t be thrown away in the trash or recycled at municipal recycling centers or paying recycling facilities like Encore Recyclers. This material is important to dispose of properly—but it’s also dangerous and difficult to work withHowever, there is a solution! The city of Garland, the city of Dallas, and Encore are all concerned with the health of our community and our environment, so we thought we’d let you know about an upcoming opportunity to dispose of some of your hazardous materials ethically and responsibly. The city of Dallas puts on BOPA collection events a few times every year, and the next one is coming right up on November 11th. Mark your calendars—it’s time to do some good in the community by getting rid of these materials the right way. What is all this BOPA stuff, anyway? BOPA stands for Batteries, Oil, Paint, and Antifreeze. These are fairly common materials that many Dallas residents have, but cannot be disposed of safely through the city’s usual trash collection system. On November 11th, though, residents of Dallas County—which includes most Garland residents—may bring their BOPA materials to the BOPA Mobile, which will be at 5639 Forest Lane. Waste collection will happen on this day between 8am and 11am. Be sure to note that BOPA includes oil filters as well as liquid oil. Oil filters are also dangerous to throw in the regular trash—but they can also be picked up for free at this upcoming collection event! It’s a question we get again and again: how do you make your trip to your local Dallas recycler as easy, safe, and lucrative as possible? Everyone from people who are just starting to think about scrapping to those that have earned a living doing it is interested in saving time and making money. Today on our blog we have a few tips from the pros here at Encore Recyclers to make your next (or even your first) trip to the scrap yard a breeze. The first is separating your metals. While we often give this tip to new scrappers to help them make the most money (because Encore and other Garland-area scrap metal recyclers can always pay more when they know exactly what they’re buying), this is also an important way to get yourself organized before setting out on your trip. The second is packing your truck properly. We recommend buying a few bungee cords or other tie-downs and a good tarp before starting to scrap. These items are cheap and easily accessible, and can help you keep your scrap organized in your vehicle—and secure on your trip. You never want to lose time or money by having scrap fall off of your truck on the way to the yard. Zinc is one of the most often overlooked scrap metals. However, with the right know-how and a little hard work and experience, you can easily turn zinc into cash with Encore Recyclers. While you’re making money, you’ll also be helping the planet! Zinc is a widely-used metal. Its most common use is in treating steel through a process called galvanization, which essentially involves coating the steel with zinc. This is done to make the steel more durable, especially protecting it from the effects of environmental changes. Zinc is also a widely-used material in many alloys (blends of different naturally occurring metals to create a new metal), most commonly in brass. Zinc is fairly widely recycled. Somewhere around 80% of used zinc is recycled. However, that’s still much less than some other metals! Steel, for example, is virtually 100% recycled—no reusable structural steel goes to waste. On top of this discrepancy, there’s another problem. Although 94% of structural steel is made from recycled material, only about 30% of zinc is. That means that a lot of energy is being expended on mining zinc, instead of using more environmentally friendly (and otherwise equivalent) recycled zinc. However, new recycling technologies are making it much easier to separate zinc from other metals, so both the amount of zinc recycled and the percentage of new zinc made from recycled materials should go up soon. This change will be good for the environment and economy—and you can be a part of it!